In the spirit of the upcoming U.S. 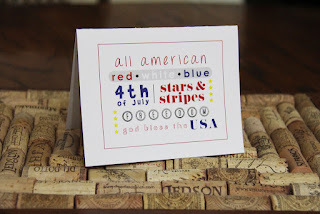 Independence Day and the CutCardStock Design Team showing how great cards can look with just a single layer of cardstock, here is a special digital image for our blog viewers. Simply print out this image on your favorite cardstock or blank card and share the spirit of the Stars and Stripes! This image is FREE for the first 15 viewers who download it and just $1.00 after that. Just head over to CutCardStock.com and get your copy. You'll see a watermark on the image, but that will be removed for your downloaded, high quality pdf print file. Enjoy!